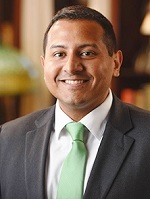 The focus of our study was to evaluate whether initial and subsequent chromoendoscopy (CE) in patients with inflammatory bowel disease (IBD) and a history of colorectal dysplasia detects additional dysplastic lesions that were not seen on the index colonoscopy with standard or high-definition (HD) white-light endoscopy (WLE). In addition, we sought to explore whether such findings influenced the management of these patients. The recent SCENIC guidelines suggested CE rather than WLE for initial dysplasia surveillance in IBD patients. However, there is limited data on the yield of initial and subsequent CE in the group of patients with a history of dysplasia on WLE and its impact on management plans. In our study, the first CE identified dysplasia in 59 of the 95 patients. The first CE was 19 times more likely to detect flat dysplasia and 93% less likely to miss dysplasia compared with index WLE. The majority of the lesions detected at the first CE were removed endoscopically, most commonly located in the cecum/ascending colon. A subsequent CE was performed in 44 patients with new dysplasia detected in 20 patients. Our study shows that CE is better than WLE at detecting flat dysplasia in IBD patients. It is also less likely to miss dysplasia. Additionally, most of the visualized dysplastic lesions during CE can be resected at the time of endoscopy. The importance of continued surveillance with CE is shown in our study where subsequent CE detected new dysplastic lesions including detecting multifocal low grade dysplasia that resulted in surgery. 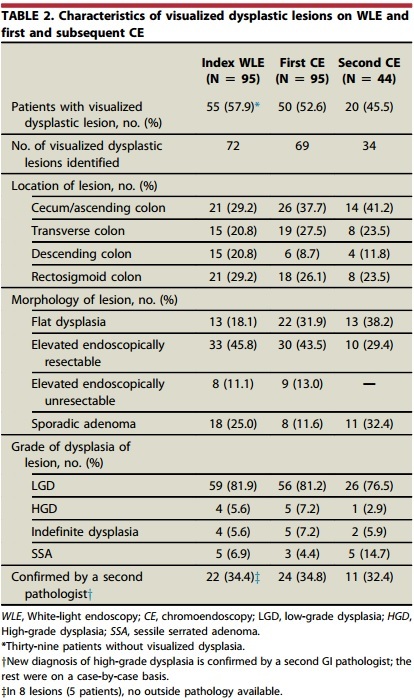 The majority of lesions were resected during endoscopy though 5 patients were referred for surgery due to multifocal dysplasia detected on CE. A next step would be to continue to follow this cohort to better understand if new lesions continue to be detected at subsequent CE and if there is a survival benefit. Also, a separate study would be to look at the patients who did not have dysplasia at the time of the 2nd CE to see if they do develop dysplasia on future examinations. This might help us identify patients who may benefit from infrequent screening with CE.